This recipe is so good it has sprouted wings and is traveling the planet. Kay McKinney gave this recipe to her daughter-in-law, Kerry Krueger McKinney, who gave it to her mom, Judy Krueger, who passed it along to me in an act of love. 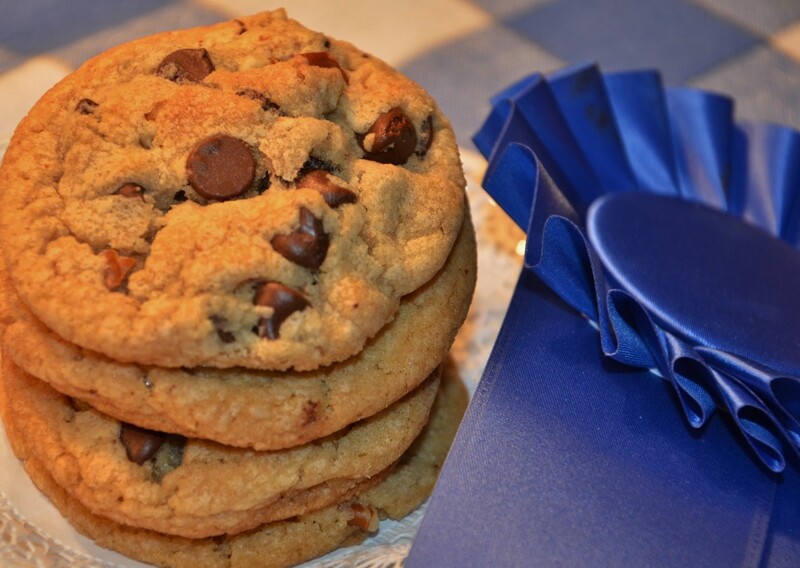 It won the blue ribbon at the county fair the first year they had the cookie division. Originally, when I saw it called for Crisco, I was surprised. So I made three test batches and took them to a church group get together of some pretty tough characters. One batch had plain Crisco, one had butter flavored Crisco, and in one I used butter- the real deal butter. After a lot of munching, comments and hand waving (usually toward the mouth holding a cookie), the plain Crisco batch won hands down. Cream Crisco and both sugars together. Mix in vanilla, salt and baking soda. Add choc chips and nuts and combine until evenly distributed. Bake for 10-12 minutes on a sprayed cookie sheet. Judy leaves them in for 11 minutes and gets around 47 out of a batch of 3” cookies. I make mine a little smaller and I get around 66 out of a batch. The number would also depend on how much cookie dough you eat prior to rolling out your balls….. If you refrigerate your dough, it will probably take 12 minutes to bake.